Skeleton Hands Black Leather Bracelet | BUDK.com - Knives & Swords At The Lowest Prices! 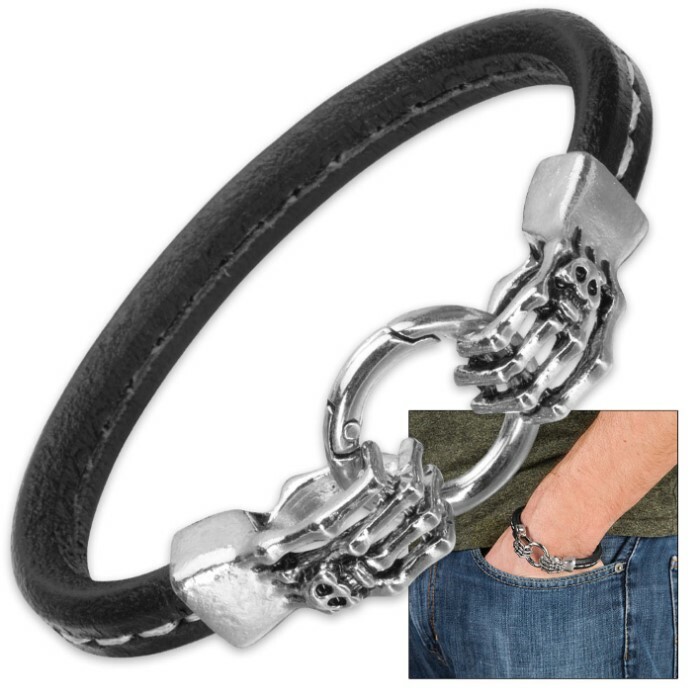 If you thought “creepy” could never be “stylish,” you’ve never seen one of these Skeleton Hands Black Leather Bracelets! The 9” band is simple enough, just a handsome black strip of stitched leather, but the clasp - two stainless steel skeleton hands grasping a connecting ring - takes this jewelry to a whole new plane of eccentric-chic. Each bony hand clasp features fine details like joints and even a skull-shaped ring appropriately placed on the skeleton’s ring finger. This hip piece looks great with any wardrobe or personal style, especially a goth or rock-and-roll motif. Get one to wear on your own wrist and a second for a friend! You won’t find better prices on unique, stylish jewelry like this anywhere else, so order today!